In order to look your best, it is important to understand that not everything we like is what looks good. Each individual has a certain face shape, skin tone, or body type that makes certain styles look particularly fabulous. Here’s a guide to hairstyles that will look great on your face shape! 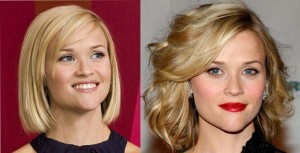 Heart- Like Reese Witherspoon, you will look best with a choppy or soft wave bob that accentuates the angles of your face. Adding a side swept bang will increase the lovely look. Oval- If you have an oval shaped face, you join celebs like Jennifer Anniston and Heidi Klum who have some of the best hairstyles in the world. The oval shape has a lot of symmetry and you can get away with practically anything. The best styles we love are the center part, angled lob cut! Square- This is a similar shape to heart, however if you have a square shape face you’re one of the bold and beautiful that can pull of an edgy pixie cut like Kiera Knightly & Ginnifer Goodwin. Round- The long, sleek, layered look creates a great style for anyone with a round face shape. Mila Kunis and Emma Stone wear it often and well. If you want to do something fresh, try a blunt bang. Rectangle- Whether you wear your hair short or long is up to you, but adding lots of layers and volume along with a side part, will create the best look. Adding layers to a longer style will avoid making your face shape look longer than it is. Giving your hair theses few options will give the illusion of more angles, like Eva Mendes.